I don’t know about you, but we love going on roadtrips. Exploring new places, meeting new people, eating unhealthy snacks, I mean hey, what’s not to like. Well this year, we’re taking Lectora training on the road! That’s right, for the first time ever, we will be taking our open enrollment Lectora training classes to you. And yes, we are bringing all the chips and tricks with us. Wait, did I say chips, I meant TIPS… sorry about that, I’m already thinking about those snacks I mentioned earlier. So, you may be asking yourself, “where are they going? !” We are fueling up and getting started here in Atlanta, GA June 18th-21st. There’s still time to register for this class! 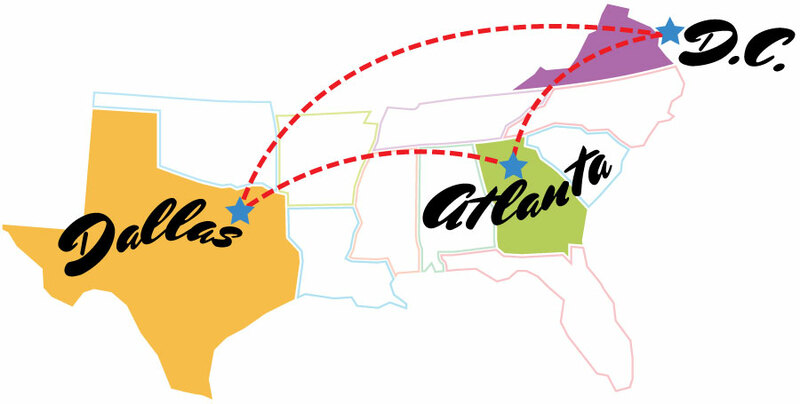 After the Atlanta class we are headed for, Dallas Texas! The Lone Star State better get ready because our Lectora instructors are headed their way! Our GPS says Dallas in September. Class dates will be September 10th, 11th, and 12th. Next stop… Washington, D.C. Estimated time of arrival? December 11th, 12th, and 13th. So what classes will we be offering? Well that’s where it gets even more exciting. Rather than offer our normal four-day class schedule, we decided to mix it up for our roadtrip. The first two days of training will be Lectora Fundamentals and Intermediate. The third day is when things are going to get interesting! We will be offering two separate classes on the third day, both half-day courses. The first half of the day will be the Camtasia for Lectora class. The second half of the day will be a new class offering that we are really excited about. We will be introducing an ADA Section 508 Accessibility course for Lectora. With more and more industries and organizations requiring their training to be accessible to those with disabilities, we think this is a great time to offer this brand-new class. A blog going in to more detail about this class is soon to come and there is more information on the product page that you can find here. If you couldn’t tell already, we are extremely excited about our roadtrip! If you live in or around Atlanta, Dallas or D.C., we would love to have you join us! Registration is currently open, and we have plenty of seats available on the tour bus for you to come along. We hope to see you there!